It is always a pleasure to receive a copy of the latest Wisden. It is a sign, as much as anything, that the summer is upon us. One may just need to look twice at the cover photograph to double-check that it is indeed Virat Kohli - playing a reverse sweep - who adorns the 2017 Almanack. The impressive Kohli is the 2016 Leading Cricketer in the World. It may be taken as read that the annual coverage of global cricket is, as always, exemplary and I imagine that just about everything should be found within the 1536 pages of this year's almanack. Sky Sport's statistician, Benedict Bermange, features regularly with a Five Stats You May Have Missed and I suspect that budding statisticians may feel that they are on the right track if they had already noticed some. I found T20 coverage within Wisden 2017 an interesting area. Understandably, scorecard coverage is, within the many domestic competitions, restricted to the latter stages of any tournament but a recent addition is the number of dot balls bowled in bowling figures. Okay, purists may dislike seeing a far greater number in what should have been the maidens column but I suppose it is a sign of the times. Equally interesting is the continuation of batsmen's dismissals being given by a bowler's number rather than a name. Three Englishmen and two retiring greats from Pakistan make up the Five Cricketers of the Year. Ben Duckett, whose fine form led to a call-up to the Test team, is one of the English trio, the others being the impressive Chris Woakes and Toby Roland-Jones whose last-day Championship hat-trick saw Middlesex win their first championship since 1993. The remarkable Misbah-ul-Haq and Younis Khan, the former in his 40s and the latter not far short, both still playing thoroughly decent cricket at the time of their retirements, complete the famous five. Australian lady, Ellyse Perry, who should be much in evidence this summer in England, is the Leading Woman Cricketer in the World. As always, the Unusual Occurrences is fun. Van's inhumanity to van - a reference to Gloucestershire's Graeme van Buuren twice being dismissed in the same match by Glamorgan's Timm van der Gugten - is reminiscent of John Arlott's comment in the 1940s when England's captain, George Mann, was dismissed, after apparently much beating of the bat, by South Africa's "Tufty" Mann. 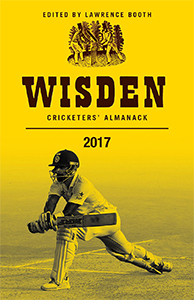 As always, Wisden 2017 is a treat and is, needless to say, beautifully presented.